On 29 May the Somkhanda Game Reserve priority species monitoring team heard the sound of very young lion cubs vocalising close to what was thought to perhaps be a den site. “For the next two months the pride’s movements remained consistent. They gave us no clues and we wondered if we hadn’t in fact imagined the young cubs’ chorus”, says Wildlife ACT Senior Monitor, Pippa Orpen. But in July 2018, to much excitement, the Somkhanda pride emerged with four new lion cubs. These magnificent creatures never cease to amaze – their bond is tangible. The adults and older lion cubs are intensely affectionate and tolerant of the young ones, the four new mischievous cubs demand round-the-clock attention and they are keeping the others on their toes! As seen in this video, the older female cub from the first litter (born last year) has a tendency to sit on her younger siblings when she has had enough of their antics. Ecologically, lions play a pivotal role in keeping Somkhanda’s ecosystem in equilibrium. Lions are carnivores and have no natural predators besides man, which makes them apex predators or keystone species. Monitoring them assists reserve management to better understand their impacts on the reserve’s systems and processes and make informed decisions. Due to habitat destruction and human persecution, fewer than 25,000 lions remain in the wild today, and their range has diminished by approximately 80%. 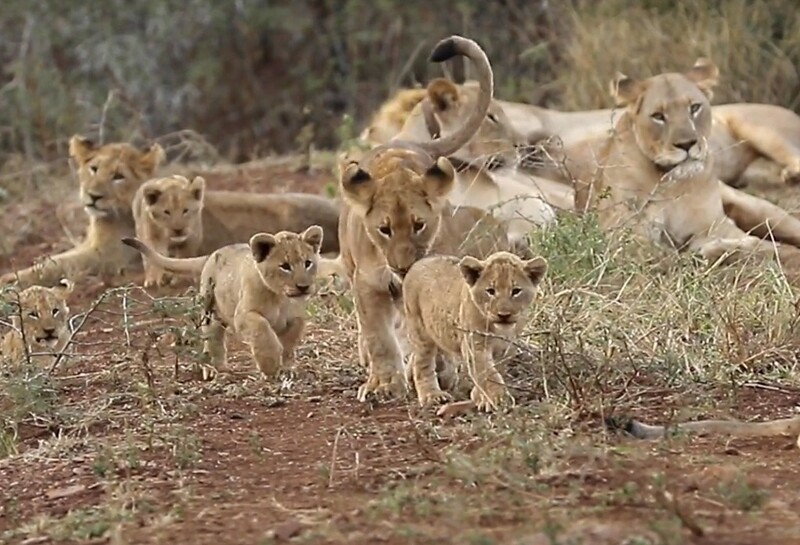 WILDTRUST, together with the Gumbi community – the landowners of Somkhanda Game Reserve – introduced a population of lions to the reserve in 2016 to help restore balance and contribute to the conservation of this important species. The lions and other priority species are monitored daily by Wildlife ACT.